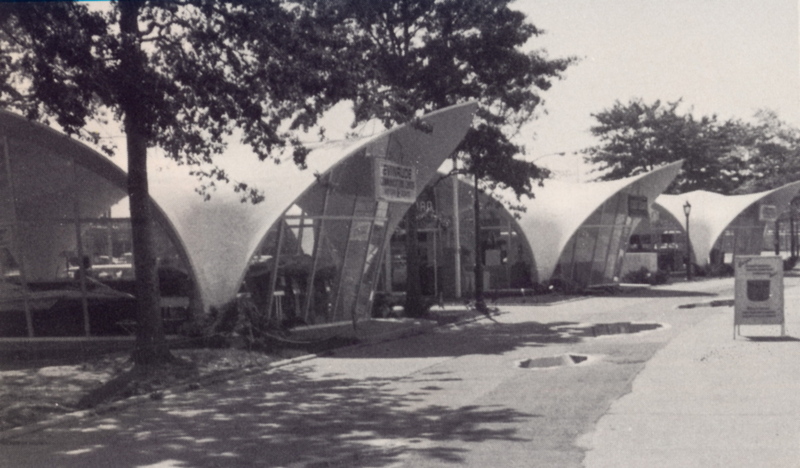 Have you seen these prefab structures? Aren't they cool? 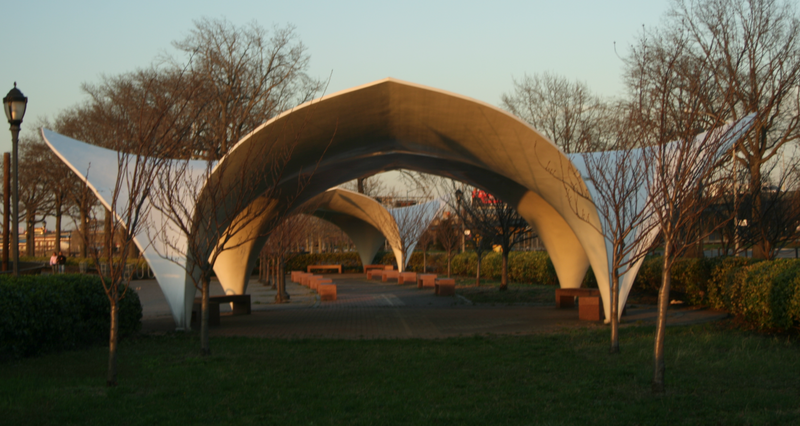 They're located on the Flushing Bay Promenade in Queens, a few hundred yards from the Mets' new stadium. Millions of people have seen them over the past 45 years, but almost nobody knows anything about them. The Candela Structures: A New York City History Mystery, a new exhibition at the City Reliquary, tells the story of these underappreciated fiberglass formations and the surprising culture of mystery and misinformation surrounding them, from their origins as exhibit spaces during the 1964 World's Fair to their current status as neglected but enduring landmarks on the Queens waterfront. The exhibit has been produced by journalist Paul Lukas and architect Kirsten Hively, who developed a crush on the Candela Structures last year and decided to investigate their backstory. What began as a quick research project turned into an eight-month odyssey of dead ends, wrong turns, and architectural obsession. The resulting exhibit should give these underrated structures the attention they've long deserved. The exhibit will kick off with an opening reception on May 16th, 7pm, at the City Reliquary. Arts and crafts materials will be provided, so guests can sculpt their own Candela Structures, and the Reliquary will also provide "Save the Candelas" letters and envelopes, so guests can petition city officials to provide the Candelas with sorely needed repairs. Beer and other refreshments will be provided, and DJ Stacher will kick out the jams with mid-1960s pop-garage, psychedelia and Shea Stadium live concert hits. The Candela Structures: A New York City History Mystery will remain on view at the Reliquary through June 28th. 6 – 10pm, Afterparty in the City Reliquary’s spacious backyard. It’s a block party for your bicycle! Come and celebrate at our fifth annual Bicycle Fetish Day, with Bike related events including, but not limited to, awards and celebrations of bicycle culture, bike artwork, bicycle rides, and bicycle beautification stations to spiff up your wheels. Burgers, & Dogs of the meat and veggie kind will be on sale at the grill, and Brooklyn Beer will be purchasable at the Museum. Local bike-related organizations will be on-hand to share pro-cycling gear and information, including but not limited to: The Pablo Legal Defense Fund, Outlier Tailored Performance, Taliah Lempert, Transportation Alternatives, and many more. Afterparty at the City Reliquary’s spacious backyard to follow, featuring funky bike and cycle soul with DJ Barney Iller. Photos from Museum2Museum Bike Ride: From the City Reliquary to the QMA! Check out the photos of our awesome ride!! Join the most civic cyclists in town for a fun, free and leisurely bicycle ride from Museum2Museum – Brooklyn to Queens. We will depart the City Reliquary at 2pm, wind our way through Williamsburg and East Williamsburg, into Long Island City, Elmhurst, Corona, and finally Flushing-Meadows Corona Park, for the QMA’s Queens International 4 closing party. Total miles: 6.5. Meet at 1:30pm, leave 2pm, return 6pm. Join the most civic cyclists in town for a fun, free, leisurely and historical bicycle ride from North to South Brooklyn and back. Travel along America's first urban bicycle lane, traverse various "deep Brooklyn 'hoods" and end at Dead Horse Bay, aka Bottle Beach. After a rest, we'll return the way we came. End at the City Reliquary for the official opening of the Candela Structures: A New York City History Mystery! Total miles: 21. 6/6 Civic Bike Ride to the LIC Bike Parade Celebrating the 100th Anniversary of the Queensboro Bridge! Meet at 11:45am, depart at 12noon. Arrive at Queensboro bridge at 12:45pm, depart at 1pm, Arrive at Socrates Sculpture Park at 2pm. Over Spilt Milk: The Fight for Fair Price and Fair Profit in Depression Era New York. Consumer-Farmer Milk Cooperative pamphlets and broadsides, vintage milk cartons, and miniature dioramas on display. The show will feature documents and artifacts from the 1930s, when immigrant Meyer Parodneck and a handful of anti-poverty activists founded the Consumer-Farmer Milk Cooperative to ensure farmers received a fair price, and consumers paid a fair price, for milk. The Co-op played a pivotal role opening the market controlled by milk distribution giants. With their own processing plants and distribution stations, the Consumer-Farmer Co-op sold milk to consumers at the lowest possible price, and paid farmers the highest possible return, for nearly fifty years. Overcoming a mountain of obstacles, this organization made a difference to hundreds of struggling farmers and to the children of low-income New Yorkers. The exhibition includes period Co-op newsletters and advertising campaigns, vintage paper milk containers, and cooperative movement propaganda. Pivotal moments in the Co-op's story are illustrated with miniature dioramas. 2/27 BROTHER CAN YOU SPARE SOME RENT? Times are tough all around – rollercoaster stock markets, job losses by the hundreds of thousands, bipartisan bickering with no relief in sight. It’s even tougher for 501 (c) (3) non-profit Community Museums. So the City Reliquary is hosting a fundraiser to raise some of (last month’s!) rent. BROTHER CAN YOU SPARE SOME RENT? is a Modern Day Depression-Era Fundraiser held in our backroom and backyard. For a minimum $10 tax-deductible donation at the door, you can come and participate in scores of historical diversions and entertainments circa 1935. Pie the Landlord! That’s right: the City Reliquary will have our very own cigar-chomping, unshaven, smelly Landlord demanding our rent! Tell him where to shove it with a whipped cream pie in his face! Hobo Photos a Go-Go: Take your picture in our hand painted carnival sign. Remember the Recession of ’09 with a photographic keepsake! DIY Fingerless Gloves Table! Because nothing says Depression-chic than rockin’ a pair of fingerless gloves! Prohibition-era Beer provided by the Brooklyn Brewery and Depression-era “Rum” Punch provided by the City Reliquary at contemporary-recession era prices. All entertainments and diversions will be priced at the Depression-friendly rates of $2-5 a pop. All proceeds go to help the City Reliquary pay (last month’s, and this one’s) rent. Announcing the City Reliquary's first Summer Benefit Party! favorite community museum on July 31 at 7:00pm. (metropolitan level -- includes a Reliquary membership!). opportunity to "Win-a-Date with a Reliquarian." BOX 110948, Brooklyn, NY 11211 or by cash or check night-of the party. Thanks for your support and see you on July 31! Harbor Tours of the Brooklyn Bridge with the Roebling Family! Take an hour-long New York Harbor cruise aboard the NY Water Taxi with The Levys' Unique New York! NY's First Family of Tour Guides portraying the family that built the Brooklyn Bridge – John, Washington and Emily Roebling. Tour will include a first person narrative of the history, drama, tragedy and triumph of the building of The Great Bridge by one of the Roeblings or a caisson worker. Cruise beneath its majestic Gothic arches and sail past Lady Liberty and Ellis Island. Tours depart from South Street Seaport on May 22nd, 23rd, 24th, and 25th at 10:30 am, 12noon and 1pm. May 24th aka BRIDGE DAY! Brooklyn Bridge Birthday Bike Ride! This year celebrating 125 years since opening day May 24th, 1883. 370 Metropolitan Ave. near Havemeyer St. The bicycle ride will depart from the Museum and culminate on the Brooklyn anchorage of the Brooklyn Bridge, approximately 10 miles roundtrip. We will be met with Birthday cake, beverages, and a lively presentation of the bridge's illustrious history. Souvenir t-shirts will be on sale at the CR giftshop. Suggested donation $5; or free with purchase of t-shirt. Afterparty 8pm –latepm at the City Reliquary: 370 Metropolitan Avenue. A Street fair for your bicycle! Show off your ride and revel in the beauty of all types, styles, and genres of specialized, customized, and personalized bicycles. CONTESTS throughout the day: Best in Show, Best Vintage, Best Hand-made, Best Chopper, Best Small Wheel (includes foldable bikes), Wheelies, BMX tricks, Track bike tricks, Heaviest Bike, Ugliest Bike, and more. Games, Rides, Bike Beautification Station, Merch tables and more! Live performances by the Rude Mechanical Orchestra, NYC’s finest street-art-protest-radical-marching-band-and-dance-troupe! DJs Stacher and Dirtyfinger from Black Label Bicycle Club laying down the tracks and inducing a dance riot! Burgers & dogs, both carnivorous & herbivorous for sale! Cheap beer to be enjoyed in the beautiful City Reliquary backyard / veranda! Peruse arts and crafts at local organizational tables. Come and enjoy the springtime and bring yer bike! Free Afterparty to be held at the City Reliquary, 370 Metropolitan Avenue at Havemeyer, 8-late. Tunes provided by DJs Stacher and DirtyFinger. L train to Lorimer St.; G train to Metropolitan Ave.; J, M, Z train to Marcy Ave.
Tribue to Our City will be held on Havemeyer Street between Grand & Hope Sts. A neighborhood pot-luck picnic in the streets complete with live music, games, entertainment, free food and good will all day long! Please come out to join us. Recapturing the love, laughter, and tears of her Italian-American childhood in East Harlem’s Little Italy, LuLu LoLo in a virtuoso performance—without intermission—and with inventive costume changes and songs—fills the stage with a non-stop parade of eleven family characters and vignettes such as Making Macaroni with Grandma LuLu, Great Aunt Lena Warding off the Evil Eye (Mal Occhio), The Seven Fishes of Christmas Eve Dinner and other scenes which take the audience back to the tenement life of her Italian immigrant grandparents. Theatergoers from all backgrounds will recognize themselves and their families in this poignant, exhilarating, and heartwarming show. 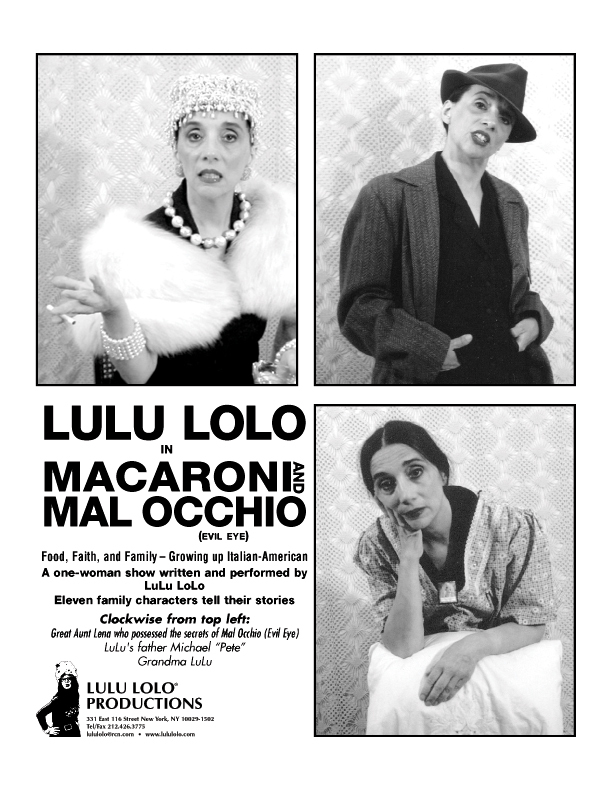 LuLu LoLo is an actor/playwright who has written and performed five acclaimed one-person plays Off-Broadway highlighting her immigrant family heritage and the dramatic struggle of women in New York City’s past. LuLu has performed at Metropolitan Playhouse, NY; FAR (Field Artist Residency) Space; Hofstra University; Columbia University; Stony Brook University; Casa Italiana Zerilli-Marimo NYU; Garibaldi-Meucci Museum; Lower East Side Tenement Museum Theater; Raw Space, NY; 2004 Columbus, OH Gay and Lesbian Theatre Festival; and Provincetown Fringe Festival, MA. LuLu is a multi-disciplinary artist whose work has been exhibited worldwide. The New York Times and The Village Voice have reviewed her work. LuLu was also a contestant on Who Wants To Be a Millionaire. 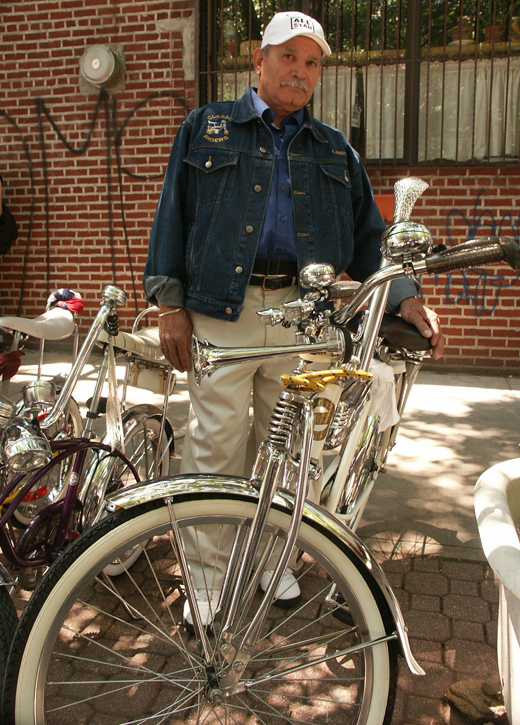 Larry from Classic Riders B.C. winner of "Best in Show 2005"
Bicycle contests, live music, food, raffle prizes all day long! Sat. 4/7 The Panorama Challenge! For More Information contact matt@cityreliquary.org or call (718) R-U-CIVIC. Hosted by The Levys’ Unique New York! Think you know New York? 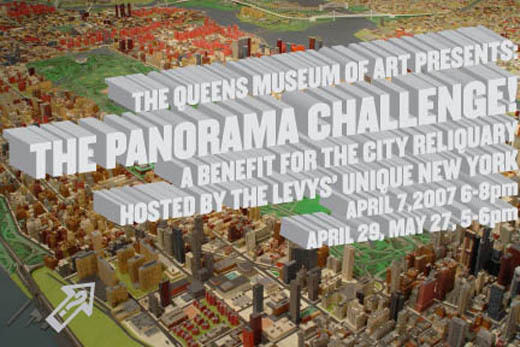 Brush up on your history, grab your geographical guidebooks, round up your friends and head out to the Queens Museum of Art on April 7th from 6 – 8pm for the City Reliquary’s fundraiser of the year: The Panorama Challenge! The Panorama Challenge is a geographical trivia-based game night at the newly refurbished Panorama of the City of New York that pits teams of knowledgeable New Yorkers against one another for prizes and prestige. Directed by laser-wielding Game Controllers, teams of ten will identify landmarks, parks, neighborhoods, bridges, bodies of water and more out of the Panorama’s almost one million structures. Enjoy libations provided by Brooklyn Brewery; rah-rah along with the City Reliquettes – our very own brainy, brawny Community Cheerleaders; listen to the wise advice of Manhattan Borough Historian Michael Miscione, one of our Celebrity Judges, as they settle disputes. Form your own team or find one at the Challenge! $25, includes two free drinks. Join us for the first ever City Reliquary Poetry Event! Thursday February 22 at 7:30 PM at The City Reliquary Museum (370 Metropolitan Ave.) Seating is Limited, so come early. Featured Readers: Michael McDonough, Jeremy Schmall, and New York Times guest-columnist, Jennifer Michael Hecht. John Foti will be performing original music with Charlie Faye. Admission: a very affordable $5 museum donation which includes one free drink. Refreshments and museum tours to follow. This special sidewalk reception will reveal the astounding collections of Kyle Supley, a current Williamsburgh resident. Beginning at the young age of 8 years old, Kyle has ammassed an impressive collection of memorabilia from the 1939-1940 New York World's Fair among many other collections. The extensive and educational display featured in the CR sidewalk windows extends into one full display case inside our museum, complete with actual technicolor film footage of the fair. In addition to this exhibition, we will also be unveiling our annual Holiday Window Display decorated with care by another of Kyle's extensive collections, Vintage Holiday Decor. Please stop by to help us celebrate the astounding collections on display and enjoy free refreshments and museum tours. Village Voice "Best Of New York 2006"
Just as you suspected, the City Reliquary is officially the "best-dressed window museum" in New York. Read all about it in this year's "Best of New York" edition of the Village Voice. The City Reliquary will be designing a satellite museum for the upcoming Dumbo Arts Festival. The City Reliquary will be installing a mini-mini-museum in the DUMBO Arts Center building, which will be on display through November 12th. The temporary exhibit will feature a tribute to one of our heroes and a major inspiration for the Reliquary, Adam Petrella, as well as previously unexhibited New York City Artifacts. Every year the City Reliquary organizes a "Tribute to Our City" in honor of the strength and unity New Yorkers demonstrated surrounding the events of September 11th, 2001. We close down a block of Havemeyer Street, have a neighborhood-wide potluck lunch, listen to live local bands play and offer you a chance to meet your neighbors. We need all the grills and chefs we can get together. So, bring out your BBQ equipment, or if you can loan some equipment for the day please contact george@cityreliquary.org. If you know a band, speaker, or performer who would like to participate, please contact dave@cityreliquary.org. Saturday, September 9th from 12:00 to 6:00 PM on Havemeyer Street between Grand St. & Metropolitan Av. Appearances by Manhattan Borough Historian Mike Miscione, Brooklyn Poet Laureat Ken Siegelman, live bands, Brooklyn street games, FDNY Fire Safety Education, free food all day, and much more in the works. To see pictures from last year's event, go to: "Tribute to Our City"
We don't know what special doings we'll have in the works for this event yet, but you can bet that they'll be worth more than the fifty cent admission. on July 1st 2006 from noon until 5 PM. Find the festival on Havemeyer between Grand & Metropolitan. After party on Hope street between Havemeyer & Roebling Sts. An INCREDIBLE DAY AND NIGHT for you and YOUR BIKE!!! this year's event is not to be missed! All the information is just below. at Union Pool 484 Union Av. @ Meeker St. Performance artist LuLu LoLo explains the COLLYER BROS.
Meeker St. under the BQE. Collectors, see you Sunday at 4:00PM. Doors open at 5:00 PM. most importantly, our beautiful new windows! Civic pride, honorary degrees, and delicious refreshments. A special appearance by our honored guest, CHARLENE MITCHELL. and Political Repression, the organization that grew out of the campaign to free Angela Davis. A portrait of Ms.
presenter of Presidential Plates, Christy Gast. made of 100% hand-felted wool. his 9-inch top hat and supports his own weight with absolutely NO INTERNAL ARMATURE. LIVE at 7am, 8am, and with recorded highlights throughout the day. We'll keep you posted with the final dates for these two exciting events! just 2 blocks away from our current residence! This means GREAT OPPORTUNITIES for our museum and the scope of COMMUNITY OFFERINGS which we have dreamed of and planned for so long. Soon to come will be: a museum dedicated to preserving and displaying the artifacts of New York History which often go overlooked by those larger museums, a public space for community events, an office for our Civic Organization meetings, educational classes, and neighborhood comradery, as well as a quintessential Museum Gift Shop complete with unique New York souvenirs, books, hand-made keepsakes, and the original "City Reliquary T-Shirt." Rest assured, this will not be another Williamsburgh boutique. We'll be maintaining our window-museum style charm on Metropolitan Avenue as well as part of our displays on Grand Street and all the other things you love about the Reliquary. At this time of great new beginnings, I want to extend SINCERE APPRECIATION to all of our SUPPORTERS. It is due to all your enthusiasm, involvement, and endurance of these e-mailings, that we have been able to begin this next step as a civic organization for-the-people, not-for-profit! OPENING DAY of new facility will be within the next few months, and we will be sure to invite the entire neighborhood to celebrate with us. In the mean time, feel free to stop by and witness the MUSEUM-IN-PROGRESS. This month, WCRM starts a little earlier but is bound to stay up later as the theme this month is COFFEE. We'll have this month's collector Rodger Stevens in the studio for a few questions about his display of NYC Paper Coffee Cups in our Community Collections window. We've also asked Marshall Brain, creator and chief contributor of HowStuffWorks.com, to explain for us "How Coffee Works." Throughout this broadcast we will be treated to a selection of music curated by Erica Matthews, resident Coffee Connoisseur. Erica also brings us movie quotes, literary references, and coffee facts as we dig into the cultural effects of the coffee bean. Regular contributers to the show this month include: Jesse James Arnold, Dave Herman, Mindy Abovitz and George Ferrandi. Write to wcrm@cityreliquary.org for more info, music requests, feedback, and other comments. All of the most reputable Brooklyn historical organizations will be gathering for the annual Brooklyn Historical Fair. YES, the City Reliquary was personally invited to participate by the great Brooklyn Borough Historian, Ron Schweiger. We will have a fine display of Brooklyn artifacts on-site at the New Utrecht Reform Church on 18th Avenue and 84th Street in Bensonhurst. This is yet another Reliquary event which will be FREE and open to the public. Please stop by as this will also be an excellent opportunity for you, yourself, to become a fully recognized card-holding member of the City Reliquary and recieve all of the honors, attributes, and gifts due to a person of your stature. Here's the official; info:. On Saturday, November 5, Borough President Marty Markowitz and Brooklyn Borough Historian Ron Schweiger present the Brooklyn History Fair. Brooklynites and visitors of all ages are invited to this free public event to view memorabilia representing Brooklyn’s unique past. Brooklyn authors Brian Merlis and Lee Rosenzweig, whose works focus on the history of Brooklyn’s neighborhoods, will also be on hand. The event boasts a wide array of photos, documents, maps, and artifacts assembled by nearly 20 diverse historical groups and museums. 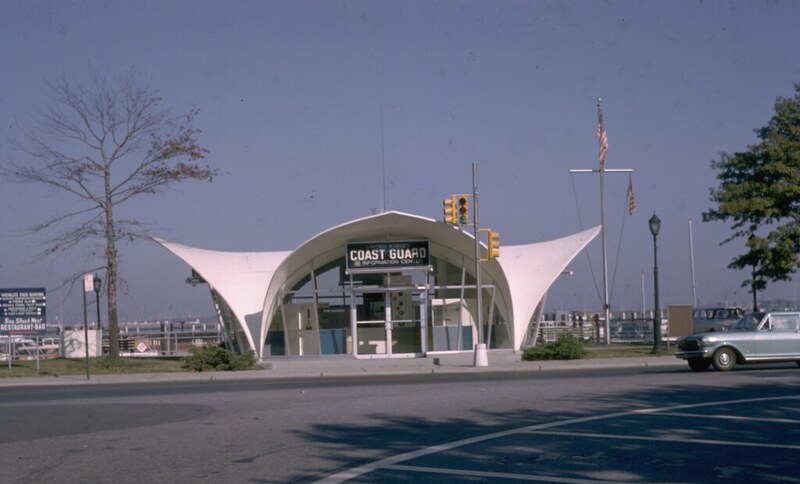 Participating organizations include the Coney Island Museum, Brooklyn Theater History, Friends of Historic New Utrecht, The Bay Ridge Historical Society, The Canarsie History Museum, The Harbor Defense Museum at Fort Hamilton, Weeksville Museum, The Greenpoint Monitor Museum, the City Reliquary and other local historical groups. History buffs will cherish the opportunity to view relics of Historic Weeksville, a 19th century community named for James Weeks, an African American who purchased the land in 1838. Baseball lovers will enjoy Brooklyn Dodgers memorabilia. The event will also include diving archaeology, featuring 19th century artifacts recovered from the waters near Coney Island and under the Verrazano-Narrows Bridge. Here is a FLYER for you to look at too! Yes it is open to the public, but the location is top secret. You'll have to write to friends@cityreliquary.org for full disclosure. "The September Tribute to Our City"
plus, the street will be closed for you to enjoy your picnic lunch under the trees. All Day - bring your own B.B.Q. We will also be sharing delicious treats such as Big Apples and Big Apple Cider supplied by Red Orchard Apple Farms, home made Brooklyn Browncakes, freshly grilled Cobblestone Corn, and many other less witty delicacies. 1:00 - SALSA & SAMBA HOUR - Bring your drums, shakers, congas, and whistles to join in the street music of Williamsburg's Puerto Rican Southside. 2:00 - CIRCUS CONTRAPTION - This Seattle-based circus will have musical and acrobatic performances to coincide with their New York show currently running at the Theater for the New City. 3:00 - RUDE MECHANICAL ORCHESTRA - Enjoy the sounds of this street marching band as seen at Bicycle Fetish Day, The Mermaid Parade, and many other events around town. 4:00 - LAVENDER LAKE - The impressive jazz duo of Mindy Abovitz and Tianna Kennedy, both of WCRM Radio show fame! 5:00 - THE GOOD GOOD - If you've seen them before you know this indie band always lives up to their name! 6:00 - PINATALAND - As heard on the WCRM September Tribute radio show, this incredible band finds their inspiration in the rich history of our great city, New York! We will also be accepting donations for the Red Cross Hurricane Katrina fund throughout the day. Please stop by to enjoy the benefits of civic life and appreciate the greatness of being a New Yorker during this special day of remembrance. The streets are yours. Let's enjoy them together. Friday, August 19th at the City Reliquary (Grand & Havemeyer), 7:30 PM, FREE for the people! Collector of the Month, Ervin Mendez presents just a small sample of his collection of over 300 bobble-heads. Better known as "nodders" to the proffesionals, these nodding figures will fill the Reliquary windows through September 8th, complete with animatronics, black light figures, and an LED display! Come to the reception for "jiggly" refreshments, and a chance to win the Giant Bobble-Head RAFFLE! This oversized nodder is a promotional character for the Funko company Wacky Wobblers which make up the majority of Ervin's collection and has an "MSRP" (Manufacturer's Suggested Retail Price) of over $200.00!!! Featured in the Matzoh Files' "Top Drawer Exhibition" will be a selection of New York City specimens by Resident Geologist Nik Sokol. Also included will be selections from the Streit's Factory and City Reliquary Archives displayed by V.P. of Collections Bill Scanga. The show opens at noon as a part of the Alan Ginsberg inspired Lower East Side "Howl Festival".